This class can be used to add MultiThreading-like Functionality to PHP. 1. 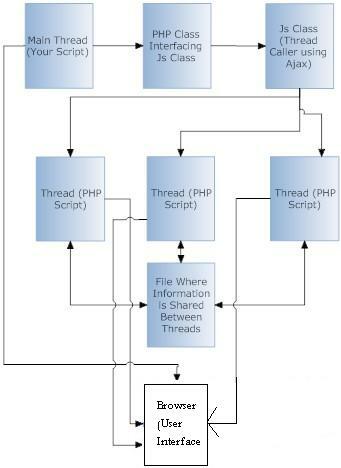 Sockets : in Sockets Method it uses PHPSockets to generate POST requests to server to trigger Thread Execution. 3. CLI : in CLI Methods OS Specific Shell Calls are used to trigger Thread Execution [Exec() must be enabled]. Multiple scripts may be executed in parallel. Each thread may take it's own parameters . 3. Threads can communicate directly & Share data (Communication is Fully encapsulated) . 5. Abstract Mutex Class which can be used from user defined Communication Clases . 6. Threads can interact directly with user in Ajax Method (works best with FireFox as it implements Ajax as it should) . Prize: One subscription to the PDF edition of the magazine by PHP Architect Some times applications need to execute tasks that may take a long time to finish. Ideally the users should be able to keep track of the progress of the tasks being executed, so they know how much of the whole task has been done and what long it may take to end. This class can help solving these problems using AJAX requests to trigger the execution of long one or more tasks on the server side, as well retrieving information about the progress of the tasks while they have not yet finished.